I didn't comment when it debuted two weeks ago, but I wanted to revisit Addazio's Youtube clips. There a good underlying message in them, with this one focusing on accountability. Is it a little cliche? Sure, but the theme of the message is true and Addazio delivers it in a believable manner. It is refreshing to have a coach who can shape and deliver this sort of message. My only concern about the whole things is the lack of views. BC's official Youtube page posted the clip two weeks ago. In that time only 1,100 have viewed the clip. This is the type of clip that should go to every BC fan and every recruit and be in the tens of thousands of views after two weeks. Addazio's willingness to be the face of the program is valuable. Let's not waste such a great asset. 2014 Preview Questions: How good is the Offensive Line? Given BC's history with OLine play, it is surprising that it took until last year for an offensive coach to say "forget skill players, maybe we should just put out eight offensive lineman." The jumbo packages combined with the spread proved to be a good wrinkle. It played to our strengths and depth. I am sure this year we will see new wrinkles, but I don't think teams will be as surprised or that we have the same depth to pull it off. The big question is how good can this Oline be? Their success as a unit will impact BC's season more than any other. During the decline under Spaz, the most obvious weakness was offensive line play. Mistakes, confusion and sloppy technique were evident. One of the reasons for last season's turn around was simply better position coaching. Which shouldn't have been a surprise since Addazio was a former OLine coach. You assumed that he would put an emphasis on the unit and find a good position coach (which he did in Justin Frye). In Year 2 -- with another year of good coaching -- things should be better. But it is not always that simple. The middle of the line returns. Vardaro, Gallik and Williams should all probably be in the same position as last year. But those three were also the most inconsistent of our starters last season. Vardaro and Gallik would play really well some games and struggle in others. With Gallik receiving a series of preseason accolades, I assume the coaches are expecting a big season season from him. But who replaces the Tackles? It is assumed that it will be another Florida transfer Ian Silberman and Seth Betancourt. But the coaches could easily move Vardaro and Williams wide and use Silberman and Betancourt on the interior. It really depends on what Frye thinks is most important, position familiarity or putting you best talent at Tackle. I also don't know if and how often we will go big. Opponents have had a whole offseason to prepare. Without the surprise will the big packages be as effective? Also, do we have the depth? Are the guys on the bench able to come in and play? Are we better off with multiple Tight Ends? Unlike our questions at WR, I have more confidence that the Oline will come together. The talent and coaching is too good for it not to come together. And if it doesn't come together...we're screwed. BC added another WR to the recruiting class on Friday. New Jersey WR Nolan Borgersen set records last year and recently improved his speed. Hopefully he'll be as productive as our last under the radar recruit from Westwood -- BJ Raji. Although he went high to Columbus, future Eagle Sonny Milano is committed to playing for Jerry York next year. Vancouver drafted Demko, which seems appropriate given their familiarity with BC goaltenders. The Devils' draft pick Joey Dudek is also committed to playing at BC. 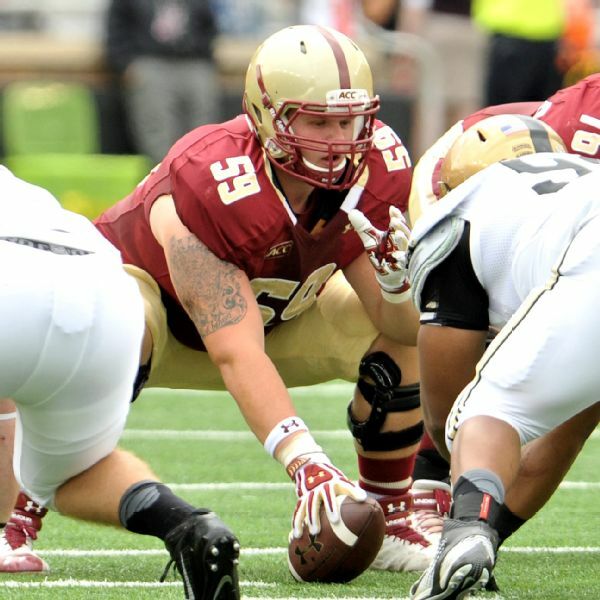 This MAC blog is already previewing the BC-UMass game. Remeber David Sills? He's the former 7th grader who verballed to USC. Now that he's older and Lane Kiffin is not around, Sills is not headed to USC. BC offered a scholarship, but most expect him to go to West Virginia. Judge Wilken: Does "SEC" get confused for the Securities and Exchange Commission? Sankey: "In my part of the country, generally not." A long-time member of the Boston College community William B. Neenan, S.J. passed away Wednesday. Father Neenan came to BC in 1979 and serve the university in a variety of leadership capacities since. He will be missed by all. The recruiting train continued Thursday. Mass CB/Athlete Taj-Amir Torres committed after camping. He's raw and without a natural position, but he's fast. Like really, really fast. Let's hope the staff has a plan for his ability. Joining him in the 2015 class is California DT Ray Smith. Smith has some decent west coast offers. WR coach Todd Fitch's Florida roots were a big factor in Mehdi El Attrach decision. Californian Thatcher Demko credits Gretzky for the hockey boom that launched his career. Tennis' Matthew Wagner made the 2014 All-ACC Academic Men's Tennis Team. Addazio's staff isn't slowing down on the recruiting front. Three more recruits committed Wednesday. The group represents a good mix of local late bloomers and versatile recruits from strong football regions. Davon Jones jumped on board first. He camped at BC and is local, so the staff must have a good feel for his potential. Of the latest prospects, he's the least heralded, but the familiarity should calm any concerns about his potential. Jimmy Martin committed too. He's another versatile athlete out of Florida. He's projected as a Linebacker or Fullback at this level. Martin held offers from other ACC schools, a Big Ten program and a bunch of mid-majors in the south. The biggest surprise of the day was Virginia linebacker Tanner Karafa. He had offers from both UVA and Virginia Tech. Karafa also had multiple Ivy League offers, so you know he can fit in academically. I don't know why there has been such a rush of verbals. My guess is some of these guys had deadlines as it looks like Addazio is ready to fill out most of the class. I expected things to slow down, but with the way things are going Addazio might be to 25 recruits by the end of the week! Does David Blatt open or close doors for Tyrese Rice? David Blatt recently made history when we was hired directly from the Euroleague to coach the Cavaliers with no prior NBA experience. The longtime international coach is coming off a Euroleague Championship when his club, Maccabi Tel Aviv, capped off a surprise run in May. The MVP of that team: Tyrese Rice. Since leaving BC, Rice has bounced around Europe. He's shown flashes of his potential but never took over a team for an extended time until this year. But now that he's proven himself at the second highest level, it might make sense to come back to the U.S. and give the NBA one more try. Still a great shooter, Rice could be an instant offense guy on the right team. Blatt knows what he can do. It would seem natural to bring along his best player to add depth to the Cavs. But Rice and Blatt had issues in the beginning of the season. There's also the issue of Rice's money. At this point he's established in Europe. He will play the whole season. I have no idea if any NBA team would give him a guaranteed contract (beyond the usual 10-day for guys who have bounced around). I always root for BC guys and still think Rice has been overlooked. Sure he is a defensive liability, but he can score. Bringing Blatt over is proof that the NBA is watching. If his old coach doesn't want to bring him, maybe another NBA team will. It has been a busy summer for Addazio's recruiters. The latest news is that Florida Athlete Mehdi El Attrach committed. Mehbi has decent size and good speed. I could see him growing into a linebacker. But as an athlete, they are not slotting him for any position yet. He could also play WR or DB. While not highly ranked, he does have a decent list of offers. Soaring to Glory posted a map of the hometowns of Addazio's recruits. The map reinforces our slight shift from the Midwest to more emphasis on the ACC states. This is the time of year where everyone produces their respective list ranking any and everything in college football. This one has Addazio as the 10th best coach in the conference. It is still so early in his tenure here at BC, that I don't know how anyone can really rank accurately. Athlon didn't think much of our individual defensive players, but ESPN thinks Daniels might surprise. BC's color commentator Pete Cronan had some of his best seasons with the Redskins, so it is only natural that he has an opinion on the team name. Because of our commitment to graduation rates, BC usually honors scholarships over four years. But with other private schools making it a formal stance, BC should probably follow suit. The NCAA rules allow for one year, renewable scholarships. This technically means that any player can be dropped from a team year to year. Now even the coldest and most cynical of coaches and teams (like Saban) don't just cut players who underperform. They usually encourage transferring or find some medical excuse to get them off the team but still receive a free education. Making something formal that we already practice doesn't seem like a big leap. BC should do it for the PR advantage and for recruiting purposes. We sell the BC experience and the BC education. Offering a four year scholarship just reinforces that position. Although each game is its own event, I do think college football -- with its short season and young players -- lends itself to game to game momentum. That comes into play with Syracuse since we face them at the end of the season again and they have a bear of a schedule (as USA Today's preview points out). They play Notre Dame, Maryland and at Central Michigan out of conference. I think there is a good chance they are out of bowl contention before the come to Boston. Let's hope they have thrown in the towel by then. Virginia Tech is another team we get late in the season. This preview emphasizes what we already know: their D will be good and their offense will be a question mark all year. Colorado State returns all of their key offensive starters and might be a tougher opponent than we think. Kuechly talked about BC football. Another busy two days for the BC recruiting staff. Friday, Ohio WR Chase Pankey committed. Pankey has good speed and hails from another Cincinnati Catholic School power. His offer list isn't overwhelming, but he has interest from plenty of major conference teams. I am just glad we are keeping a presence in Ohio. Pankey is the type of guy who has thrived at BC in the past. The bigger recruiting news came Saturday, when local TE Chris Garrison committed too. Getting locals stars is crucial and Garrison had offers from most of the FCS and FBS programs in the northeast. Addazio now has 15 verbals but still has plenty of space. Based on current recruiting pace, I expect us to pick up a few more guys this summer and then get the last five or six commitments during the season. @damienwoody seriously, you are unbelievable. What else is on your schedule for today? You reviewing a movie later this afternoon ? "Welcome to the Bitcoin Bowl! Please do not take off your Guy Fawkes mask or use your real name at any time." The Heights posted an excellent Q&A with Jim Christian. What I found most interesting is that he's not watching tape of last season. He explains that he's doing it so everyone has a clean slate and because he is running something totally different. However, you would think he would want to see how the players played during live action. At least Clifford is looking healthy. BC is one of many ACC schools to get on late-blooming basketball prospect Rayjon Tucker. Phil Steele is a big believer in experience and developed his own metrics to measure it. The numbers don't look good for BC. There are reports that the Women's backup Goalie Megan Miller is transferring to Wisconsin. UNC-Asheville hired BC's pitching coach. Chase Rettig is making the most of limited snaps with the Packers. The Raiders signed Emmett Cleary. The Eagles are giving Momah a second chance in Philadelphia. What do you expect from Addazio this year? In first years, fans tend to want a new coach to show improvement. They want to see healthy change as the new leader puts his stamp on the program. Years 3 and 4 are when expectations rise. A full roster of his own players and a few trips around the conference means the team should be ready to win. But Year 2 isn't as defined...for BC or any team really. I think the general consensus among BC fans is that we'll be a borderline bowl team again. If we take a step back, it will only be because we overachieved last year and are very young. But historically Year 2 hasn't been a good barometer for any BC coach. Take a look at coaches in their second year since Holovak. Over the 11 coaches there is not great pattern. You want to read into Coughlin's four win improvement, but how can you when Chlebek improved by five wins? Henning fell apart, but Spaz held things together. Jags' record declined but I know many of us felt his second year was a more impressive coaching job. I think and want Addazio to do well this season. But I don't think we can read too much into our final record. The key for me will be how we compete and how the players he recruited start to develop. Brad Bates issued another "letter" from the AD desk, this time regarding the game day experience. I applaud him for the series and reaching out to share his thoughts. I also appreciate the renovations in Alumni. However, I think he and many of his fellow sports leaders are missing the boat on the competition for the game day experience. Watching the game is better at home and it is cheaper. That will never be the competition. That is people's default. But better replay and easier parking, or even cheaper tickets are not the answer to getting people to the game. Getting people to the game is about experiences you cannot get at home. That is why the band is important. That is why tailgating is critical. That is why having traditions like the Eagle or getting your picture with Baldwin makes a difference. Running on the field after the game is something you cannot do if you stay home. Social media is great but nothing beats the communal experience of watching a tense game with thousands of like-minded people. If you want people to pay extra and make the effort, remind them of what is unique about seeing a game live. Replays and parking and even food need to be good. The stuff you cannot duplicate at home needs to be great. Then people will come. Then they will feel they are part of something. Florida Athlete Michael Walker committed to Addazio Tuesday. He is under the radar and smallish, but does hold an offer from Arizona. Tampa Bay cut Emmett Cleary. He still has plenty of time to catch on with another team. Like many of us, Matt Ryan is also a BC sports fan. Thatcher Demko posted another update to his blog as he preps for the NHL Draft. When Ty-Meer Brown announced he would play his fifth year at BC, it seemed too good to be true. We need DB help and he was familiar with Don Brown's system. Of course the catch was UConn had declared him medically ineligible. Many questioned why BC would take on the liability of a player with a potential serious neck issue. It turns out that multiple doctors have cleared Brown to play. In fact, UConn was the only program that felt he shouldn't play again. There is risk to any player that steps on the field. Brown faces risk, but his risk is not that much greater than his fellow BC teammates. Maybe it is better this way. When he takes the field, Brown won't think about injury. He also brings a dedication. Many players would opt out when given the change. Brown wants to be here and still dreams of the NFL. I am glad he decided to finish his career with us. When he committed, Jeremy Miller was the centerpiece of Donahue's 2015 recruiting class. After the coaching change, he decided to reopen his recruiting process. Usually when that happens, I expected the decommitted player to go elsewhere. Miller sounds a little different. He's hearing from other programs but still claims that BC is a possibility. He wants Christian to "recruit him." Who knows how that will play out? Seattle expects KPL to make an impact in his rookie year. BC is making a push for Florida DT Kyle Henderson. SBNation released two more previews of our future opponents. Louisville is replacing many of their key players, but they are also getting Bobby Petrino. At the college level Petrino has proven that he can win with a roster someone else recruited. SBNation's NC State preview notes how soft the Pack's schedule is. Maryland Running Back Dalonte Waters had interest from BC, but didn't meet NCAA standards and is now headed to Junior College. I doubt we will rerecruit him. I just don't see us dealing with an academic JuCo player. Bruce Pearl hasn't been able to speak to a recruit at Auburn + he's landed Antoine Mason, KC Ross-Miller, Kareem Canty, + Cinmeon Bowers. We need to adopt Brazilian single name terminology. "Starting QB, Texas A&M: JOHNNY." Former BC coach Steve Donahue has turned down Marist job, source told ESPN. BC is not directly tied to the O'Bannon battle with the NCAA, but our beloved school was mentioned Thursday by a former TV executive. "If the Boston College basketball team will share revenues from television and, lo and behold, each member of the Boston College basketball team is entitled to $200,000, I just think that's a negative," Pilson said. "I think that's a problem for the public." I don't know if Pilson pulled the BC example out of thin air or intentionally mentioned a recent under performing team, but the whole example is weird. I will keep rooting for BC athletes if they get paid. I think most BC fans would. Look at how pro sports salaries have sky rocketed. Did the sports become less popular? How about the Olympics which used to pride itself on amateurism? I think paying athletes is one of those survey questions where people answer one way and then when faced with the actuality, ultimately don't care. Hayden Rettig won't be coming to BC. Chase's brother decided to transfer to Rutgers. I understand, but I sort of don't. Rutgers runs a pro-style offense. However, the coach is on the Hot Seat. Why not play JuCo this year and see what spots open up? Matt Ryan is still using things he learned from his BC coaches. The Falcons announced they will participate in Hard Knocks this year, which means plenty of Matt Ryan time on TV. Connecticut LB William Harris committed to BC Wednesday. Florida LB Jimmy Martin picked up a BC offer after camp. Be sure to read Paul Myerberg's excellent season preview on BC. According to multiple reports and his Twitter account, Antoine Mason decided to play his final year of college basketball at Auburn. This now leaves Jim Christian and staff with very little time to find an impact player for next season. However, they still have roster space for a true transfer. Mason would have been a big get, but I am not giving up on next year. There is still a chance Olivier can put this team on his back. Despite flirtation with traditional pocket passers (see Hayden Rettig) Addazio keeps doubling down on dual threat, running QBs. The latest commit is New Jersey product Elijah Robinson. Other programs that offered Robinson include Michigan State, Nebraska and Rutgers. There's a lot to like about Robinson. He's got decent size, he's helps build our New Jersey network, and can play other positions if he cannot get on the field at QB. I don't know if we will still add other QB to this class. There are other offers out there and plenty of room in the recruiting class. I imagine the urgency will depend a lot on how Wade looks as the potential starter in 2015. USA Today previewed NC State. I was surprised by how bad NC State was last year, so I don't know if we can count on a rebound season this year. Bill Connelly at SBNation started publishing his ACC previews, including future opponents Wake Forest and Syracuse. ESPN thinks November will be the toughest part of the schedule. USA Hockey invited Demko to its United States National Junior Goaltender Evaluation Camp. If you haven't been following, Soaring to Glory is once again doing a player by player breakdown of the roster as the season nears closer. For all of last season's innovative mix of spread and jumbo packages, the fundamentals of BC's offense were decades old. We ran the ball over and over and then used play action to connect on deep passes. I have enough confidence in the offensive line and the mix of running backs, that I think they can duplicate Andre Williams' production as a group. I have not seen Murphy play much, but his arm seems adequate enough to connect on deep passes. The big question is who will catch the deep balls? Speed is really the key on long passes. If you cannot get separation downfield, a fast DB can catch up to the Reciever while the ball is still in the air. Amidon's deceptive speed was a perfect compliment to our passing game last year, as he blew by opponents with regularity. The returning pass catchers lack many essential skills but especially speed. A lot is expected of converted QB Josh Bordner, but he's not going to run by ACC DBs. Harrison Jackson's health is in question. No one knows if Bobby Swigert will be 100%. Crimmins is a possession guy. Barksdale is untested. Dudeck brings a few dimensions to the O but he's not a scorcher. It is no wonder that the coaching staff is still scouring college rosters for a 5th year guy. Shakim Phillips is expected to return, but we can't count on that until he completes his UConn degree. Of the incoming freshmen, there is potential. Nat Dixon, Gabriel McClary, Troy Flutie, and Thaddius Smith all have the chance to come in and contribute as true freshman. All they have to do is show they can run fast and still catch the ball. After last year, I do trust Addazio and Day to do the best with what talent they have. If we don't have anyone who can catch it deep, we probably won't throw it deep very often. But before they abandon something that worked so well last year, I hope they try it once or twice with a new guy. The Yankees selected Andrew Chin in the 15th round of the MLB Draft. He was the 452nd pick overall. Congrats to Andrew on getting drafted a second time (he was previously drafted out of high school). Chin now needs to decide if he wants to forego his remaining eligibility and sign this summer or complete his college career. Given his injury history, it wouldn't surprise me to see him sign. UMass announced a 3 pm kickoff for our season opener at Gillette. ESPN3 will carry the game. The Red Sox have night game, so maybe, just maybe, NESN will pick up the ESPN3 feed and distribute it locally. But then again that would make too much sense. The ACC increased its team payout by $1.2 million. What this means is that BC's major revenues are inline with the sports biggest players. Where we start to fall behind is in ticket revenue and licensing deals. 2014 Preview Questions: Where will the the sacks come from? Don Brown's defensive schemes are designed to pressure QBs and generate sacks. While the whole of the unit still wasn't great, BC's defense did generate a lot of sacks last year. It was a welcome change to the bend but don't break days of old. Year 2 of Don Brown will probably bring even more pressure, however, I have no idea where it will come from. It is nice to have Keyes, Daniels, Mihalik and (hopefully healthy) Abdesmad back, the two biggest sackers are gone. Much is expected of true Freshman Harold Landry, but can he match KPL's 6 sacks? Can any of the returning guys double their efforts? I think Brown will figure something out. I also think last season's total of 36 sacks is reachable, but to do so multiple guys will have to step up and perhaps some of the DBs will have to be involved as a new wrinkle. Despite ties to the region via pit stops at BU and URI, Jim Christian was a complete outsider to Boston College basketball. He lacked ties to our past players or our history and what works. He helped fill that void by promoting Dan McDermott to Director of Basketball Operations. I applaud the move as McDermott has worked his way up through the program and was well liked by Skinner's staff, Donahue's staff and the Athletic Department. He's the type of guy and now in the type of role, that can help Christian navigate the early days and also help him build on what's worked at BC in the past. But this isn't a hand-holding job or a hire to keep old-timers happy. McDermott is fairly progressive and was very influential in BC's ill-fated scheduling last year. The schedule -- while a factor in Donahue's undoing -- did involve analytics and a new approach to mastering the selection committees' ever-changing criteria. I am not sure how much influence McDermott will have initially with Christian's schedules or strategy, but you know he will bring a fresh approach. The Director of Operations doesn't have the same recruiting duties as the other staffers, but McDermott will be involved in gameplanning and active on the bench. I am confident he'll do well and help BC basketball get back to winning consistently. Transfer QBs are fairly commonplace in college football these days. If the depth chart gets too crowded or the coaching staff changes, QBs look for better fits. A transfer QB is my biggest reason for optimism this season, yet Murphy is only considered the 6th most important transfer QB. Like Soaring to Glory, I expect a bounce back year from Sean Duggan. He showed flashes his first two years, but was a non-factor last season. Al Louis-Jean signed a three-year rookie deal with the Bears. Who would have thought he'd get this far in the process? Incoming Women's Basketball transfer Kailey Edwards originally committed to Erik Johnson when he was still at Denver. Edwards will have to sit out the 2014-15 season. Sailing placed 4th at the APS National Championship Team Race. It looked like Jim Christian had a clear plan for 2015, but then Antoine Mason became available. BC will get the 5th year's final visit next week and his decision can drastically change BC's outlook for next season. I thought next year would be the Hanlan show: with BC's dynamic combo guard handling the ball and being its main scorer. Even when Donahue was here, I advocated an offense where Olivier drove or hit 3s and left the rest of the guys to rebound and play defense. Niagara knows what that offense was like, because they did something similar with Mason last year. I wonder how Mason fits with a team focused on Hanlan. Mason knows what's up. He is transferring so he can play at the highest level and so that he can come in carry a team from Day 1. If BC has gotten this far with him in the process, we are likely telling him that the he will score and touch the ball a lot. I have no idea how they are positioning Hanlan to Mason (or vice versa). Maybe things can work if Hanlan serves as the true point and Mason the main scorer. That seems like a waste of Olivier's abilities and efficient scoring. Ideally both would score in bunches and BC would be a dangerous team that could cause multiple matchup problems. But even if the pairing is a disaster, getting Mason to commit would be a major coup. He's the best guy available and we are selling him hard. If we land him, it will prove our coaches know how to say just the right thing to the right guys. 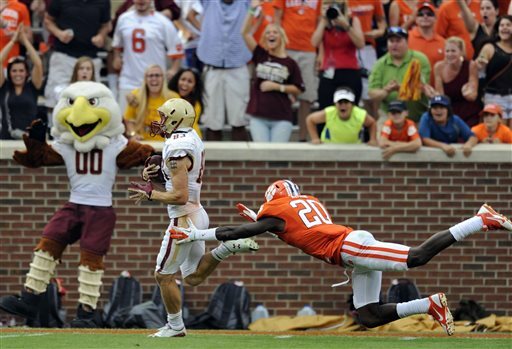 Meter joined Campus Insider to preview the ACC Football season. Meter likes UNC and expect Willis to pick up the slack after Andre Williams. Chase Rettig's brother Hayden is leaving LSU and rumored to be interested in BC. If he were to transfer to BC, he would have to sit one season and then have three years of eligibility remaining. I am sure other schools will pop up on his list, but you have to like BC's chances given our thing depth chart and his familiarity with Addazio. Jim Christian will work with Coaches vs Cancer to host a charity 5k this fall. If you are interested in running, go to BC's site for more information.